Seeing how we’re entering the holiday season when lots of photographs are taken, I thought it would be appropriate to share three ideas how you can use photos as a personal marketing strategy. In my opinion, even though we all carry a camera in pocket, we miss lots of opportunities to capture high impact photos, so get ready for 3 in 3! One of my longtime members is an owner of Oskar Huber Furniture which has served the Philly area for the past 91 years with quality furniture and design. They do a nice job on their website sharing their history and using old photos to tell their story, including the celebration of their 90th anniversary last year. My mastermind group member, Brian Mittman celebrated his law firm’s 85th anniversary last year and used old photos to create a timeline video of its history. 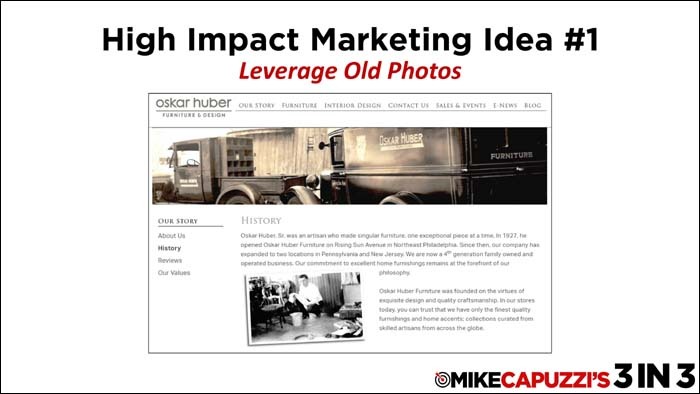 Leveraging old photos is a fun and effective way to personalize your business. 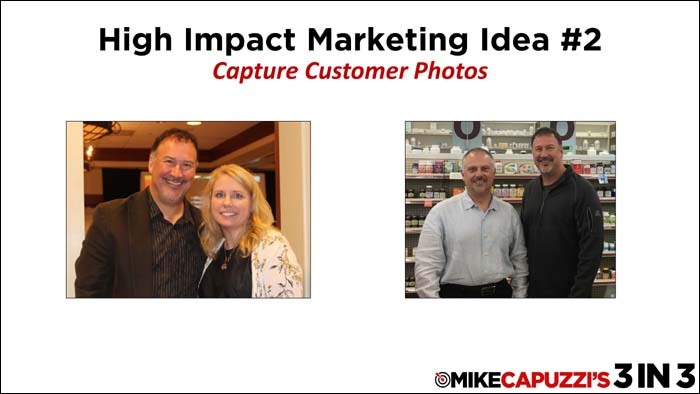 Capturing photos with you and your customers is another powerful way to personalize you and your business. Personally, I keep a digital photo album and look for opportunities to capture photos with clients and members. You never know when you might be able to use them so it’s important to capture them. Another smart strategy is to ask customers to take photos of them interacting or using your products or services. The best advice I can offer is to always have your marketing radar on for opportunities to create these types of photos, because once the moment has passed, it’s hard to recreate. 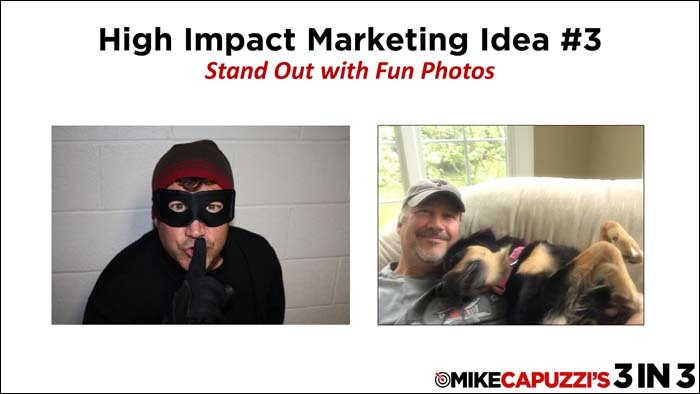 Taking fun photos of you and your team members helps personalize your business and increases your likability factor. Back when Rich Hauswirth owned his insurance agency, he used to send out monthly postcards which featured fun and quirky photos of himself. These simple postcards resulted in a lot of business for his agency. I’ve even used a few fun photos of myself over the years. The key is to lighten up and simply show you’re just a regular guy or gal. I hope you found these ideas useful and I’ve motivated you to start looking for more opportunities to capture photos for your business. For those viewers in the U.S., I wish you a Happy Thanksgiving and until next time, keep on marketing! Excellent message, Mike. Simple, obvious, but under utilized. It’s always good to be reminded, so thanks.